If you are looking to add another layer of safety to your yard, consider a security fence! Try to think of a security fence as your home’s first line of defense against intruders. A well-constructed security fence should give a homeowner more peace of mind that they are safe and protected at all times. If you have decided to get a security fence around your property, here are a few things you will need to consider! Many people would be surprised to learn that the best security fences available are actually transparent. This is because a solid fence will give a place for intruders to hide behind before they make their move. You want your fence to be see-through so when you are in your home you will be able to spot any suspicious activity on the other side of it. In terms of fence materials, you are best going with a sturdy metal like steel or wrought iron. It is a lot more difficult for someone to break through a material like metal than wood or laminate. 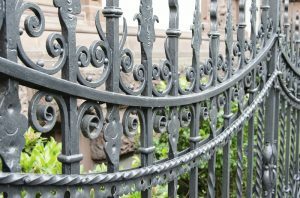 In addition to the fence materials, there are other important characteristics that you should be looking for in your new fence. To begin, you need to consider the height. A security fence needs to be at least eight feet tall. Anything shorter than that does not pose much of a challenge to burglars and intruders. However, you will want to confer with the homeowners association in your area. Sometimes, there are rules of how high fences can be. Next, you want to consider the horizontal spikes and rails that can serve as a means for intruders to climb over. If possible, don’t include this features on your fence. Unless you have adequate experience when it comes to fence installation, you are best off leaving this project to a professional. As the name suggests, the main purpose for installing a security fence is to ensure security. If your security fence is not stalled properly, it essentially defeats the purpose of the fence in the first place. This entry was posted on Friday, October 27th, 2017 at 12:24 pm. Both comments and pings are currently closed.